My favourite man and my favourite restaurant.. If you have ever visited Manchester, I’m sure that you will have been recommended Australasia. Tucked down inside its own glass cave, the restaurant lies beneath the Armani store in the Spinningfields area of Manchester. You walk down the staircase towards a white wooden haven, with white seats, white washed wooden decor and that beautiful low lit lighting that gets you immediately in the mood for a romantic evening. This was the evening of my graduation, and I had decided that me and Alex should celebrate the past four years in style. I donned my stunning new Lipsy dress with a pair of Ted Baker heels that I had been dying to wear and threw my hair into a half up and half down style, to keep my fringe from my eyes.To say that the service was impeccable would be an understatement. We were looked after so attentively, without feeling pressured or bothered. Water was always topped up, drinks were constantly flowing and the meals came out as soon as they were ready, and that was within a very short amount of time. Me and Alex chatted about our lives for the past four years and the changes we have been through, as well as projecting how we feel our lives will change from here onwards. Me and Alex will soon be moving into a wonderful new flat in London, (don’t worry Ill hook you up with the photographs first hand) and we could not be more excited. Ill be a London blogger as of January and life we definitely take a turn, hopefully for the better. So expect to see a lot more exciting content. But back to this. We chose some options we hadn’t tried previously, with myself opting for the mixed california rolls selection, with prawns, tuna, duck, salmon, avocado and asparagus all making a yummy appearance. Alex went for the tempura vegetables and they were absolutely delicious. After that, Alex went for the Monkfish main course whilst I decided on the fillet slices, which was actually a sliced up fillet steak. It was all absolutely wonderful, trust me, I tried it all. The pak choi side especially was a winner. And of course afterwards, we both went for my absolute favourite, ever, in the world, times 100, dessert. The Mango Souffle. This is thee most delicious dessert you will ever eat. So light, refreshing, sweet and full of flavour, that also comes with a pot of mango to pour over the top. I would go to this restaurant just to eat this dessert alone, it really is my most favourite dish. The fact they also personalised it with my social handle was just too much. They had already won me over; this was the cherry on the cake. This was the end to a superb day, and I was so glad I finally got to wear my blue shoes. 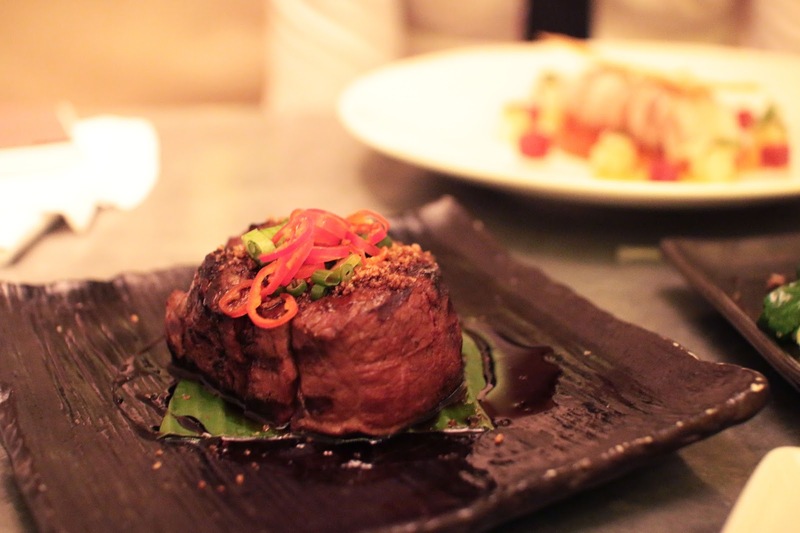 Have you ever been to Australasia? Would you agree with me?